CarCliq Used Cars - CarCliq is an online portal that lists over 150,000 used cars for sale from dealers all over the UK. Title: Choose from a wide range of new and used cars for sale from 1000s of reputable dealers in the UK. Description: Shopping, Classifieds, Automotive - CarCliq Used Cars. 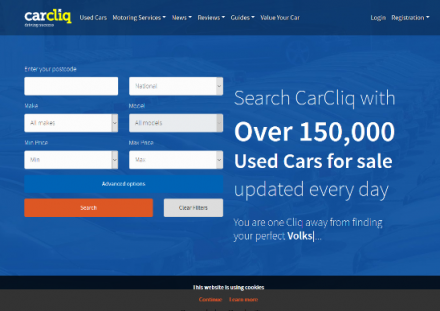 CarCliq is an online portal that lists over 150,000 used cars for sale from dealers all over the UK.